Even though the latest comic posted over a week ago, it’s worth wishing everyone a Happy New Year again, especially because there’s some Gentleman Cthulhu and other Lovecraftian news today on Gentleman Cthulhu creator J. M. DeSantis’s website today. Namely, 2019 is going to be largely a Lovecraft-themed year, including Gentleman Cthulhu and even some new site art (such as the images seen on this site right now; and there’s more yet to be shown). 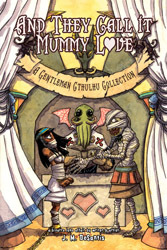 So check jmdesantis.com today and throughout 2019 for continued Lovecraftian project news and releases. Happy Holidays: I’m Still Alive! 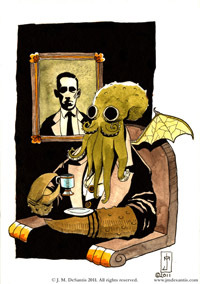 Happy Holidays, Gentleman Cthulhu fans! I’m sorry for the long absence, and if you’ve been checking my blog on jmdesantis.com or happen to be a member of my Patreon (and you’d be very informed in the latter case), you’ll know I had my reasons for taking a break.